Help reduce labor costs and improve worker productivity and well-being with the new highly portable Rubbermaid FLOW Floor Finishing System. 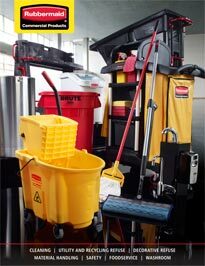 High-capacity backpack and handle system allows user-controlled release of solution for more efficient floor finishing. Rubbermaid Flow holds 1.5 gallons for finishing up to 3,000 sq ft of floor surface. The 3" diameter opening makes refilling easy. Backpack hose connects to the trigger handle using Clean Connect technology for spill-free delivery of finish solution. Red ergonomic trigger handle dispenses finish solution with each press. Backpack features venting channels to improve airflow and reduce moisture on back while wearing. Chest and waist straps distribute weight on user's hips instead of shoulders, reducing user strain. Kit includes either a Q200 Flow Nylon String Mop or a Q805 Flow Nylon Flat Mop. Both connect easily to the handle using Quick-Connect.